Should you wish to avoid me, and I wouldn’t blame you for it, but to give you fair warning it’s not easy this month. I (or to be more accurate, my book ) am in not 1 but 2 glossy magazines. 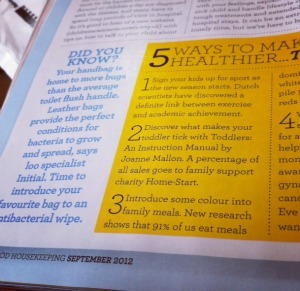 There’s a small mention on page 94 of Good Housekeeping, next to a pretty gruesome story about grotty handbags. So naturally I am adding that to my LinkedIn profile – Often found lurking next to cruddy bags. It’s good to have a differential. 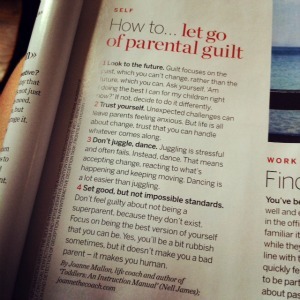 And in the September issue of Psychologies I have contributed some tips on How to let go of parental guilt, which you’ll find on page 22. That subject could be a whole book in itself (and if anybody wants to commission me it might well do so), but for now four bullet points will have to suffice. The observant amongst you may remember that at one point I was also writing another book about fear of driving. So what became of that one? Did I lose it under the pile of handbag crud on my desk? Did I give it up as too much like hard work? Did the bees eat it? Hmm…..watch this space. And don’t feed the bees.